Hi everyone! Today's 52 Christmas Card Throwdown blog challenge is a theme challenge and the theme is Christmas lights. I had a few different ideas in mind for this challenge, but then I remembered an old Stampin' Up! stamp set that I have with the little elf and his lights. This set is almost 20 years old! I stamped the images and colored them with my Stampin' Up! markers. Two of the elves were stamped, colored, and cut out. My real red and gumball green card stock layers are dry embossed using my square lattice embossing folder. Then I used the finishing edgelits for the real red border and my main image was cut using the apothecary accents framelits. There are dimensionals under the main image layer as well as the two cut out elves. Thanks everyone for stopping by. As some of you may know I am in the process of starting my own challenge blog, ABC Challenges and my very first challenge will be this Monday so I hope you'll stop by and play along! Those elves look lik they just about jump off the page...don't they? Patty - it just goes to show that a set can be as old as it likes and it still makes fabulous cards! I love your Christmas elves! Super cute Patty! Some sets are just too cute to get rid of aren't they? Love it! Those elves are so cute! I haven't seen those stamps used in forever...thanks for bringing them back! Looking forward to seeing your challenge on Monday! Patty, I love the extra elves on the card. They really make the card! What a cute card Patty--I have never seen this set and the card rocks! OMG, those elves are SO adorable!!!!! 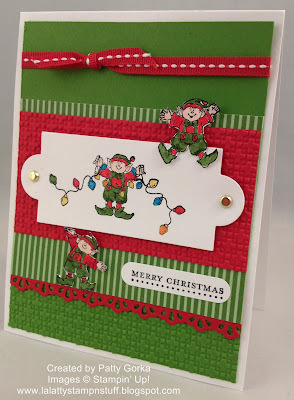 Fun, festive and fab card Patty - the elves are adorable! Super cute and I love the layout!